26 Types of Coats for Men - Can you Guess Them All? Men’s Jackets and Coats have been an essential part of sartorial fashion for a long time. To cover up during the Autumn and Winter months and to strike a pose, they have been used as a symbol of rugged masculinity and a functional piece of attire for over a century. There are different types of coats and jackets for various occasions and they are worn by men of different classes, professions, cultures and ages depending on their tastes. Due to the cultural clashes because of globalization, many tastes and designs have transferred over from different countries and entire continents. Hence, there is now a jacket for almost any occasion. There are special jackets or coats that you can wear to a dinner, a sporting event, a date, a formal event or even to your job. They are priced depending on the brand and the season of course. Here is a list of jackets and coats that you can wear for almost any occasion. The Blazer resembles the jacket of the suit, but is more casually fitted and is worn at strictly casual events. It is distinguished from a sport jacket as a more formal garment and can be tailored from solid color fabrics rather than having large splashes of different colors. Coats are the oldest forms of formal clothing. They can be closed by means of buttons, zipper or hook and loop fasteners. Other features of the coat can include collars and shoulder straps. They are worn during the winter months and the autumn months in order to keep warm. Made by the brand J. Barbour and Sons ltd, Barbour formal Jackets for men are made of waxed cotton. They have become a common element of British country clothing and has become a status symbol. So much so that any cotton waxed jacket is now called a Barbour Jacket. The Barbour Jacket was originally created to facilitate travel on motorcycles. Hence it was a status symbol for the working class man or the youth. Horsemen began wearing this to protect their clothes from the dust that blew up from the horses hooves. The dusters used to slit up the back to hip level so that they could be easy to wear. The Duster was first introduced to mass audiences in the film, the Good the Bad and the Ugly. It is credited with the revival of the clothing. Motorcyclists wear dusters today to avoid roadside dust and dirt. The fleece jacket doesn’t have buttons, so it makes do with zippers. It provides a lot of thermal insulation, but isn’t considered rain proof or snow proof. It doesn’t help you out with wind or rain. However, it is made of polar fleece or of synthetic wool. It shares its origin with clothing that was designed for horsemen to avoid dust collecting on their clothes. It has evolved in to formal wear for the modern man. Two types of tailcoats can be typically purchased. The first is the dress coat which can be worn during evening affairs and can be worn with a formal tie. The second is the morning tailcoat, which can be worn as a formal morning dress with the front tapered off. Also called the Gilet, the Body warmer is a coat that resembles a waistcoat or blouse, but doesn’t go quite as far to the knees as other coats do. Gilets are often worn as outer layer clothing during extreme clod. Fashion gilets can be made from cloth or fake fur. They can be used by workers during night or morning shifts and by professional cyclists by using light gilets with windproof fronts and mesh backs. The Bunny Hug jacket is a hooded sweatshirt with no zipper down the front. It is called the bunny hug because it literally looks as if a rabbit is giving you a hug. It is used to keep warm by young individuals and provides attire for exercise during winter as well. Also called the flight jacket, the bomber jacket was created for pilots in the air force during World War I. It became part of popular culture and apparel over the decades. It has also now identified as the letterman jacket. Though originally designed to save pilots from adverse weather, the jacket has become part of daily casual wear. The dinner suit or dinner jacket is worn at black tie events during British and American conventions. Though not completely similar to a tuxedo, it is very similar in style and in design. The dinner jacket is almost always black, navy blue or white, and is distinguished by stain jacket lapels. It is customarily worn with a white dress shirt and a bow tie. While not being much different from the bomber jacket, this is much closer to the original design for a pilot’s jacket. Considered as a symbol of rugged masculinity, this formal jacket for men has a certain allure that gets you as close to the men in uniform than any other jacket can. This is a coat that is made from the thick material, Duffel, which originated in the town of Duffel in Belgium. The fabric is especially thick and the coat is usually worn with metal hooks and laces instead of buttons. It became very fashionable in Eastern Europe during the mid to late 1800s and began being supplied to the British Royal Navy post world war II. It is now a popular garment among students in Europe during the winters. The hoodie can be perceived as a sweatshirt or a jacket with a hood. It includes a muff sewn on to the lower front and usually a string to adjust the hood’s opening. While hoods have been a major part of men’s attire for centuries, this particular iteration is seen as all purpose wear for casual settings, especially when it comes to younger individuals. It can be worn at sporting events, barbecues, parties, school meet ups and even some formal events. While primarily seen as winter wear for women, it can and is worn by men in formal settings in the winter. Fur coats made with faux furs can be worn during very harsh winters, especially in places like Northern Europe and Asia. It is also customary among people living in mountainous areas to adopt this piece of clothing. High Vis-Vests are customary clothing for many working class professions. These include yellow waistcoats, which are the most popular form used as a uniform for airport workers and construction workers among others. It is meant to provide high visibility to the wearer because they’re often working in conditions that can put them at risk of accidents. Raincoats are usually made from water resistant clothing like plastic. They are worn with a pair of boots and are meant to cover your clothing and prevent it from getting wet. There isn’t a high fashion quotient related to the raincoat, but it can be a very functional piece of clothing. Cloaks have a rich tradition of being worn by people that tend to convey mystery. They are worn by people mostly as a fashion statement or as part of a costume in today’s world rather than a means to keep warm. They are considered traditional men’s clothing to be worn in high class meetups like the Opera or the Theatre. It was worn by the British army and by troops of various armies during the Second World War. While not in fashion today, the Jerkin is considered as an essential part of sartorial history. Men’s waistcoats are considered as an essential part of the complete three piece suit. It can be worn without a coat if need be and if fashion permits. It is considered purely formal wear and has been a staple of men’s wear for centuries. The parka or anorak is a type of coat with a hood and is associated with faux fur. It was traditionally made from caribou or seal skin; however it is now made from synthetic materials. It is still used to keep warm in the frigid arctic and can sometimes be coated with fresh fish oil to keep its texture. This is the American equivalent to dinner jackets in Britain. It is worn strictly during formal events and is accompanied with a white dress shirt and a bowtie. The sports coat or jacket is traditionally viewed as appropriate wear for sporting events. It was usually worn for sporting events at exclusive clubs. However, today it can be used as casual wear for all types of events. It is usually not accompanied by any ties or bowties. It is traditionally worn over a kurta with the combination of a churidar pajama. The sherwani is usually made from thick fabrics and has the presence of a lining. It originated in India as a European style court dress for nobles and royals in British occupied India. The garment is usually considered as formal men’s wear. It is double breasted with 10 front buttons with wide lapels. It has become, through pop culture, a staple of film noir and detective fiction. It was worn by many icons of Hollywood such as Humphrey Bogart and Gregory Peck in various films. It’s a type of garment that is usually worn for protecting men from the elements. The professions that integrate overalls usually are working class professions such as construction work, hardware workers, carpenters, painters, roofers etc. They were invented by the Levi Strauss & Co. company. However, they’ve evolved considerably to reach their modern form. This is a jacket that is a thin fabric coat that is meant to withstand the wind chill and light rain for autumn or winter. It uses elastic waistbands and zippers to allow for adjustments. This is a complete breakdown of all the different types of jackets that can be bought for men. As time moves forward, new and different variations of jackets are bound to pop up. Buy the ones that suits you needs and enter the world of men’s jackets. 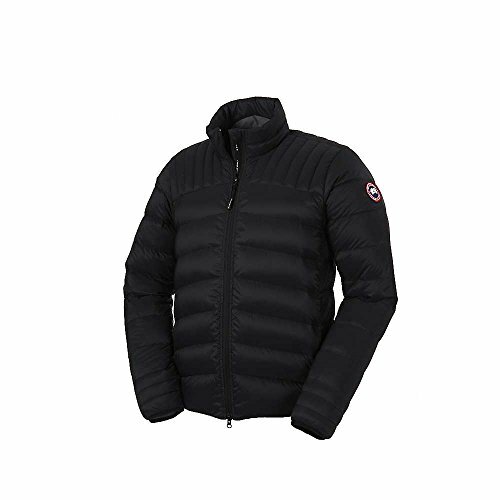 I have a Canada Goose puffer coat and love it. It’s snug, has long arms and keeps me warm. Puffer coats are down coats. They can look really puffy or not so much. They’re very popular because they keep you warm.